Just when I was wondering which face wash I should be buying for the summer, the Deep Facial Cleanser by Omved was sent to me for a review. I’ve picked up face washes from Omved earlier for gifting purposes and my better half uses the Omved No Fuss Face wash for men, but I can’t really review that! First things first, if you are looking at something that foams really well and has a mild fragrance, then this is not for you. The fragrance is a bit strong, but I like it. The first time I used it, I pumped out the face wash thrice and applied it liberally hoping it would foam. Despite the fact that it does not foam, it does clean my face really well. It leaves it squeaky clean. I use it twice a day and I have woken up to an oil free T zone. It has a thickish gel consistency and I need just one pump of the gel to use as a cleanser. I love the fragrance of the facewash, it has a typical Omved fragrance that lingers on long after you have used it. I just have one doubt about how effectively would it clean the face of people who apply makeup. I don’t use makeup at all and this facewash suits me perfectly fine. I have not experienced any breakouts as well with the use of this cleanser. I have noticed that my face is certainly clearer and the pigmentations are lesser. This 200 ml face wash is priced at INR 690 and has a shelf life of 2 years. Price is not on the high side if you see how long it lasts. It’s been over three weeks that I have been using it and a peek in the bottle tells me that it should last another 2 months at least. That is a little over 235 INR a month which is not really expensive. If you want to get 100 INR off on this, use the coupon code 557270a to avail a 100 INR off on a minimum purchase of 500 INR. The first five people who use this code to shop get a little surprise from Omved! Happy Shopping people! The coupon is valid from 14th March 2013 and for one time use only. The coupon code expires on 14th April. The online store of Omved, Purplle, HealthKart and Junglee. I would recommend this as a perfect summer facewash for people with normal to oily skin because it does clean your face really well without drying it or making it feel stretchy. What I do apply post the wash is the protective face moisturiser. The reasons why it works for me is that it is cost-effective, lasts really long and it suits my skin. And a repurchase I will do, absolutely happily! A soft-foaming, pH-balanced cleanser that effectively removes deep embedded dirt, grime and other impurities to leave skin soft, smooth and fresh. The Omved Face Wash is an ultra-gentle formulation that effectively cleanses without stripping the natural oils of the skin. *Bergamot refreshes and improves circulation. By making pigmentation and melanin even and uniform, it helps fade marks on the skin. 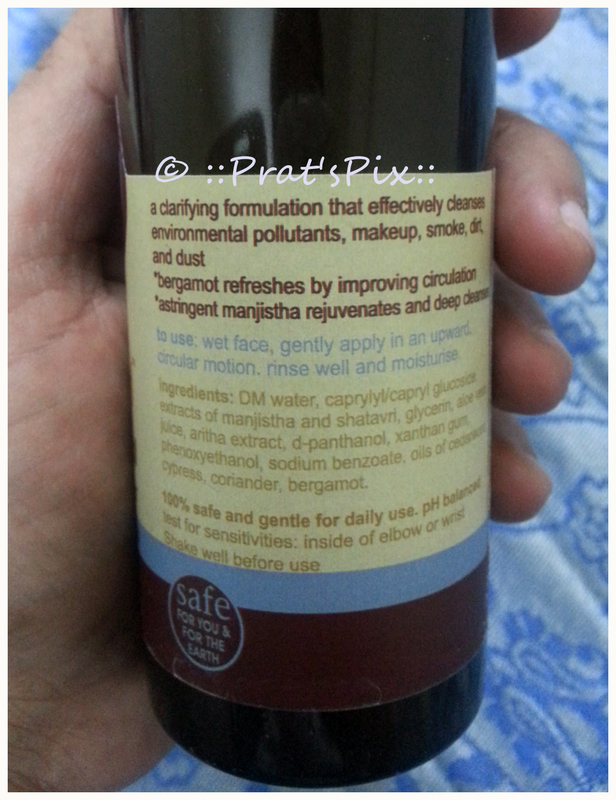 * Manjishtha is an astringent, antibacterial, skin rejuvenator. It brings a glow and lustre to the skin. Helps heal skin tissue. This 100% natural herbal cleanser is a clarifying formulation that effectively cleanses environmental pollutants, makeup, smoke, dirt, and dust to leave skin radiant and healthy. Note: Product sent by PR, but it has not influenced my review. recently bought this. haven’t noticed much of a difference except for keeping the oil at bay. I am on the second bottle now and this suited my skin really well. I have noticed a slight reduction in the pigmentation too.